This article describes how to bypass the start screen in Windows 8.1 and Windows Server 2012 R2 and automatically boot to the desktop by default. The Windows 8 Start Screen is an awesome feature for touch enabled (mobile) devices, that allows you to easily navigate the installed apps on your machine. If you are using a non-touch enabled device (a classic laptop or ultrabook) it might be useful to directly boot into the desktop environment. The simple 4-step process below will help you to configure this feature for both Windows 8.1 and Windows Server 2012 R2. With Windows 8.1 improvements have been added to the start screen experience, for example the ability to view all apps (both modern UI and desktop apps) or the ability to resize the live tiles on your start screen, more in line with the Windows Phone 8 experience. 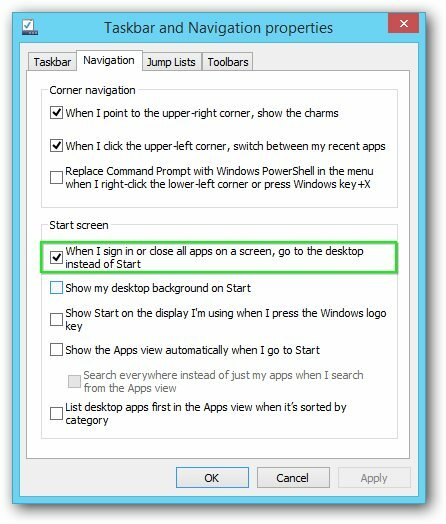 How to skip the Start screen and boot directly to the desktop in Windows 8.1 or Windows Server 2012 R2? User setting or Group Policy? It is really easy to configure Windows 8.1 or Windows Server 2012 R2 to directly boot to the desktop environment. The configuration consists of four steps that are outlined below. Now reboot your Windows 8.1 or Windows Server 2012 R2 machine and you will skip the start screen and directly boot to the desktop environment. When reading online about this setting I learned from the Petri IT Knowledge base that boot to desktop is a per-user-setting that can’t be configured via group policies. Personally I’ve configured my non-touch enabled laptops to boot directly to the desktop environment in Windows 8.1. For tablets and touch-enabled devices I personally prefer the start screen as the main starting point to get things done in my work or personal life. 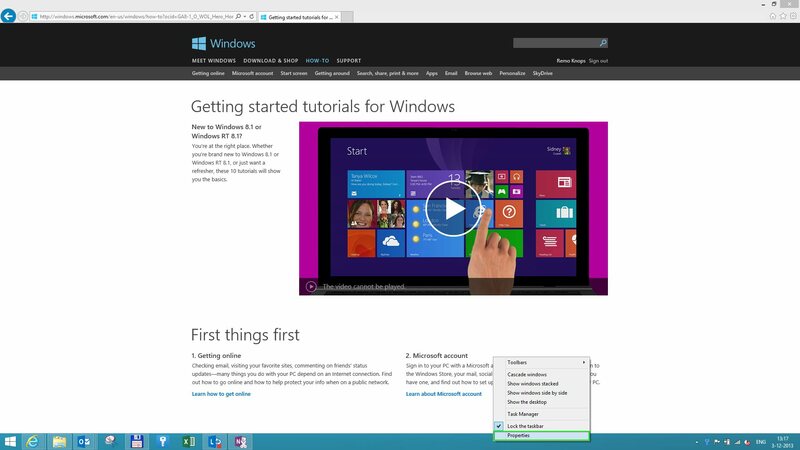 Hey!, I found this information for you: "Bypass Start Screen in Windows 8.1 and Server 2012 R2". Here is the website link: https://www.remo-knops.com/4761/bypass-start-screen-windows-8-1-and-server-2012-r2/. Thank you.